The ASEAN Enabling Masterplan 2025 seeks to complement and concretise the ASEAN Community Vision 2025 in mainstreaming the rights of persons with disabilities across all three pillars of the ASEAN Community, and fosters Member States’ commitment towards an inclusive community. It is guided by the underlying principles that for all actions concerning persons with disabilities whether undertaken by individuals, public or private social welfare institutions, courts of law, administrative authorities or legislative bodies or entities, their interests and needs must be taken into consideration, acknowledging that inclusion and mainstreaming should be promoted and specialised approaches considered as a last resort. Additionally, as ASEAN is aiming at embedding sustainable development in line with the 2030 Agenda, the Enabling Masterplan serves as a key instrument in steering its policies and programmes to be inclusive for persons with disabilities. The highlights of AICHR 2017 performance is an exclusive sneak peak of ‘The performance evaluation of the human rights mechanisms of the Association of Southeast Asian Nations (ASEAN) – the ASEAN Intergovernmental Commission on Human Rights (AICHR) and the ASEAN Commission on the Promotion and the Protection of the Rights of Women and Children (ACWC) – in 2017’. This eight annual review is produced by the Asian Forum for Human Rights and Development (FORUM-ASIA) and the Solidarity for Asian People's Advocacy (SAPA) Task Force on ASEAN and Human Rights and Working Group on ASEAN (SAPA TFAHR & WGA). 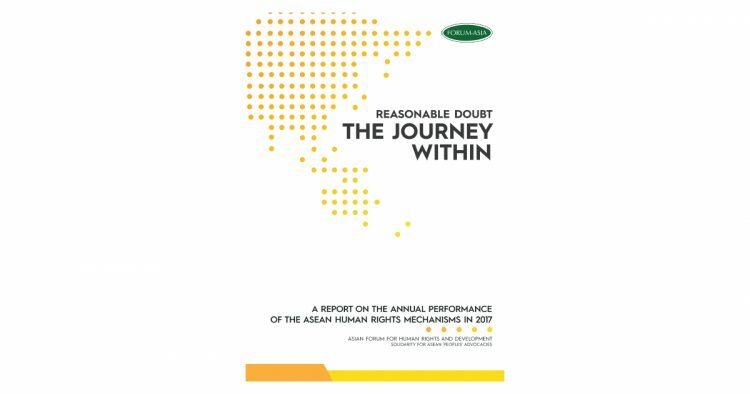 ‘Reasonable Doubt, the Journey Within – A Report on the Performance of the ASEAN Human Rights Mechanisms in 2017’ is the eighth annual review by FORUM-ASIA together with the Solidarity for Asian People’s Advocacy (SAPA) Task Force on ASEAN and Human Rights and Working Group on ASEAN (SAPA TFAHR & WGA). The report presents a review of the performance of the human rights mechanisms of the Association of Southeast Asian Nations (ASEAN) – the ASEAN Intergovernmental Commission on Human Rights (AICHR) and the ASEAN Commission on the Promotion and the Protection of the Rights of Women and Children (ACWC) – in 2017. This Annual Report covers the period between July 2017 and June 2018. As the ASEAN moves toward e orts at responding to natural disaters as a region, it has yet to fully integrate the gender approach in its regional disaster response. Already in the community-building phase of its institutional evolution, certain issues still remain in the norm-construction stage. In the case of women’s human rights in particularly di cult circumstances (e.g. natural disasters situations), there is very faint discursive recognition in institutional agreements. In the case of individual ASEAN Member States (AMS), there are more evident e orts as regards mainstreaming gender in natural disaster institutional infrastructure and mechanisms – although with some countries fairly more advanced than others. This study was undertaken in order to compile policies and practices on women’s protection in situations of natural disasters and to document best practices in gender mainstreaming in natural disaster response and assistance, particularly, those that provide spaces for women’s participation. It was guided by an institutionalist perpective that sought to locate gender in laws, policies/plans, institutions, and practices. For ve decades since its establishment, ASEAN as an intergovernmental organisation has always endeavoured towards improving the lives of the peoples in the region, particularly in the economic, political-security and socio- cultural aspects. Human rights are an integral part of the ASEAN Community and are re ected in the ASEAN Charter (Articles 1.7, 2.2.i, and 14), the ASEAN Political-Security Blueprint 2009-2015 (section A.1.5), and the ASEAN Political- Security Community Blueprint 2025 (section A.2.5). ASEAN established regional human rights bodies re ecting its strong commitment to the promotion and protection of human rights and fundamental freedoms and to further ensure the wellbeing of its people. The ASEAN Intergovernmental Commission on Human Rights (AICHR) and the ASEAN Commission on the Promotion and Protection of the Rights of Women and Children (ACWC) were established in 2009 and 2010 respectively. The AICHR, as the overarching human rights body in ASEAN with a cross-cutting mandate that handles matters related to human rights cooperation with other ASEAN Bodies, external partners and stakeholders, had set the tone for cooperation in human rights promotion and protection in ASEAN. Yet how many people within the ASEAN region know of the AICHR? And how many are aware of how the AICHR came about and what mandates it holds? This booklet is intended to provide quick facts regarding the AICHR and the development of human rights in the ASEAN region. This Annual Report covers the period between July 2015 and June 2016. The new list of AICHR Representatives for 2016 - 2018. Dr. Seree Nontashoot, Thailand Representative to the AICHR will continue his serving to the AICHR for 2nd term. The AICHR is pleased to submit the Annual Report 2015 for the consideration of the ASEAN Foreign Ministers Meeting (AMM) in accordance with the Terms of Reference of the AICHR (Article 6.6). This reporting period (July 2014 - 2015) is marked by three special occasions for the AICHR. First and foremost is the upcoming commencement of the ASEAN Community at the end of 2015, which highlights the growing importance of Community - building efforts by various organs and bodies of ASEAN including those pertaining to human rights which are a fundamental principle of the ASEAN Community by the AICHR. The AICHR recognises that the Guidelines on Accreditation of Civil Society Organisations (CSOs) adopted by the ASEAN Coordinating Council (ACC) provide an overall framework for the engagement between ASEAN and CSOs. The engagement between the AICHR and CSOs shall be conducted in adherence to the principles set out in the ASEAN Charter as well as the TOR of the AICHR. This publication provides a legal analysis of the AHRD, which is intended to assess the extent to which it is consistent with international law and ASEAN Member States’ existing international legal obligations. It assumes that ASEAN will eventually develop a regional human rights convention similar to the American, African and European Conventions, and that the AHRD will form the basis of such a Convention. The fact sheet contains the work of AICHR from 2008 to 2013, presented by AICHR at the First AICHR Regional Consultation with Stakeholders, in Jakarta, 29 April 2014.